Thai actress, Chompoo Araya A. Hargate (อารยา อัลเบอร์ต้า ฮาร์เก็ต) posted an image of her outfit on her Instagram on April 16, 2013. 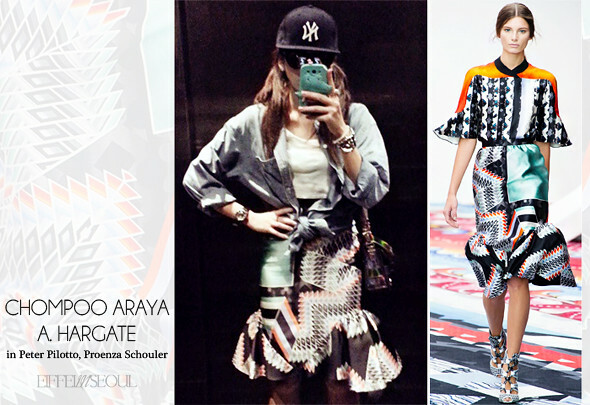 The stylish star wore a Peter Pilotto printed skirt from Spring/Summer 2013 with a white blouse and denim outerwear. A New York Yankees cap, Proenza Schouler 'PS11' mini classic in hologram and stacked cuffs in silver to accessorize her look.